For an autographed copy of any of Lesléa’s books, please send an email directly to her. Buddy and his best friend dream of being famous poets someday, but Buddy’s time is running out. He is “thin as the IV pole by his bed.” He “used to stay up all night dancing,” but now he “stays up all night coughing.” After he dies of AIDS, his best friend writes a novel in fifty poems that tells the story of his life and death. Buddy’s buddy tells the story of their friendship with rage, humor, sadness, and most of all, undying love. Poems from Still Life with Buddy earned author Lesléa Newman a prestigious Poetry Fellowship from the National Endowment for the Arts. In the 1990’s, three very good friends of mine, Gerard Rizza, Victor D’Lugin, and Stan Leventhal, died of AIDS. 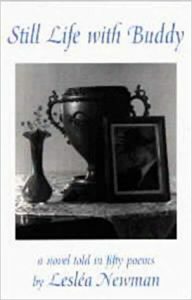 I wrote the poems in Still Life with Buddy as a way to express my sadness, anger and grief. Buddy became a composite character, based on my three friends, and the poems in Still Life with Buddy tell the story of their lives and deaths and how I learned to live without them. I still miss my friends very much. Writing Still Life with Buddy helped me keep my friends close to me.